[ePhilosophy and The Hitchhiker’s Guide to the Galaxy is a Master’s Course in Adams’s much-interpreted work. 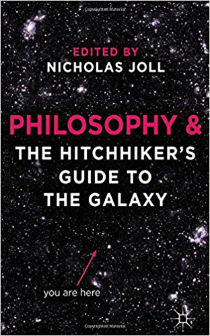 The essays are divided into four sections; “Ethics,” “The Meaning of Life,” Metaphysics and Artificial Intelligence” and “Logic, Method and Satire.” Each essayist takes a very serious approach so that for fans of the series, “Philosophy and the Hitchhikers Guide to the Galaxy” is a treasure trove of extra time with a favorite topic. The first essay in the Ethics section is titled “Eat Me: Vegetarianism and Consenting Animals” by Ben Saunders and Eloise Harding. In this fascinating essay, the authors cite Ford’s encounter with the cow at Milliways’ (The Restaurant at the End of the Universe) that begs a squeamish Ford to eat him. The author’s somewhat obvious argument that if our food talked to us we’d be less inclined to eat it is well thought out and presented in a clean, logical and intelligent way. While a book of essays analyzing a well-known work might sound a rather dry proposition, starting the work off with such an engaging essay is a very good idea that draws readers with a specific interest. The editor of the work, Nicholas Joll, has an essay of his own in the Ethics section of the work titled “Mostly Harmless? Hitchhikers and the Ethics of Entertainment.” Joll presents a topic that this reader had never really considered in reading “Hitchhikers Guide to the Galaxy;” gratuitous violence as entertainment. While first taking a broader focus, Joll narrows his focus giving very specific examples. Unlike the animal that wanted to be eaten, many of the scenes are not moments I thought about after an initial reading but in the light of Joll’s analysis warrants a second look. The compelling and cohesive presentation comes from an author both quite familiar with the work of Douglas Adams but also with a farther reaching approach. “Life, the Universe and Absurdity” by Amy Kind is perhaps my favorite work of the collected essays. Kind examines the absurdity of the idea of existence. While the piece is imbued with humor and great moments from the work of Douglas Adams, the underlying message is that humans tend to look for adeeper meaning in life when life does not have a deeper meaning. In section 2, “Well, that about wraps it up for God,” this reader could not help but think that Adams himself would have very much liked the essay. The irony of an essay about a work in which authors are looking for deeper meaning citing the absurdity of deeper meaning is one that any fan of satire will enjoy. In a general sense, I’m not a reader that enjoys deep analysis. The essays inPhilosophy and The Hitchhiker’s Guide to the Galaxy are approachable, well written, well thought out, logical and often in the spirit of the topical work. If you have an interest in “Hitchhikers Guide to the Galaxy,”Philosophy and The Hitchhiker’s Guide to the Galaxy is a work you will want to pick up immediately. Nicolas Joll studied philosophy at the University of Liverpool and Essex. He holds a Ph.D. in Philosophy from the University of Essex. His concentrations are moral philosophy, metaphilosophy, Heidegger and Adorno. He teaches at the Colchester Institute in Colchester, UK. For more information about Nicholas Joll and his work, visit his website. You can connect with him on Goodreads.